On our last family trip to San Francisco, we had 20-minute stopover in Las Vegas that turned into a two-hour-plus delay. It wasn’t due to foul weather, mechanical plane problems or really anything dangerous. The airline simply couldn’t find the crew! But what could have been an arduous waiting game, went by in the blink of an eye. After my kids had gone through their chapter books and played about 68 minutes of whatever device du jour they had with them, we pulled out a few tricks of our own. You’ve probably gone through the same thing with your own family. Of course, you can rely on electronic gizmos, but there’s only so much of that they can do. Try one of these five ways and the wait won’t be so bad. 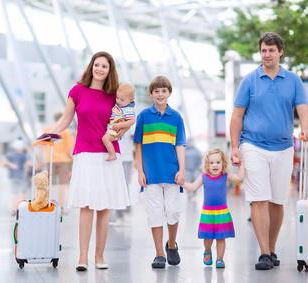 The simplest and least expensive thing you can do is stroll around the airport with your kids. Take shifts where one of you takes the kids while the other person keeps an eye on your carry-on luggage. Get out there and explore the airport! It’s good for exercise and people watching. With younger kids, play a game like I Spy or Alphabet. Older kids will enjoy browsing the stores along the way. You don’t have to settle for noshing down at the same old fast food places that every terminal has. More and more, you’ll find that major American airports now feature branches of popular local eateries. 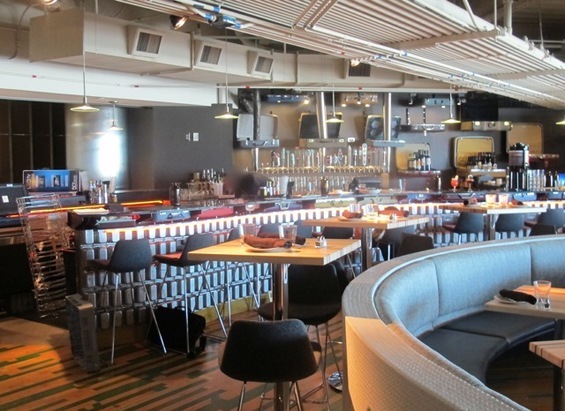 At the airport closest to me, Denver International (DIA), you can dine at local joints Denver Chop House and Root Down. If you’re concerned with higher prices, just order appetizers and/or dessert for a light meal. You may also want to look for fast-casual alternatives (think of Chipotle) that you can’t find at home. When I go to DIA, I often notice a colorful Native American photography display – Spirit of the People – near the security area. Because I’m often dashing off to a flight, I don’t have time to appreciate these pictures. 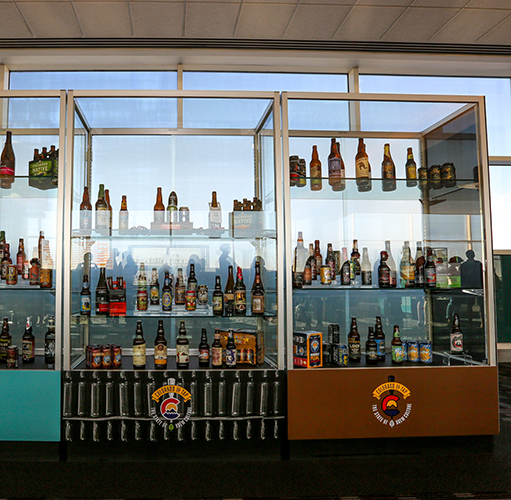 Today they feature – Colorado on Tap – an exhibit on local Colorado breweries. If I had the time, I would definitely slow down and actually appreciate them. When you’re stuck at an airport, look for these little-appreciated cultural gems. If you're delayed at Atlanta, Philadelphia, or Dallas overnight or longer, and you can’t find a hotel room for the night, you may want to check out Minute Suites. They have rates by the hour or $130 for an eight-hour flat rate. 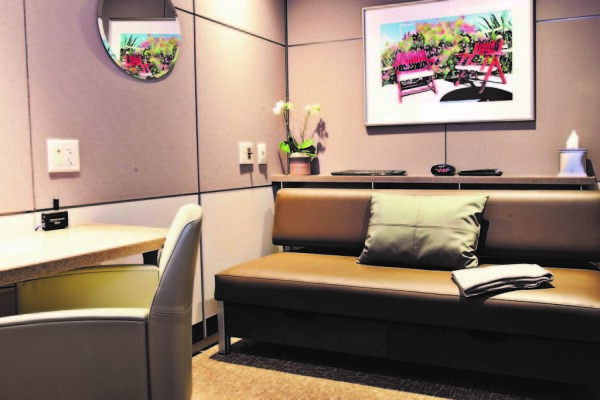 It might be a bit of a splurge, but escaping to this comfortable little oasis with a warm shower and soft bed, away from the hustle bustle of the terminal, can make a big difference during an exta long lay-over. When my kids and I were delayed in Las Vegas, I found myself wishing that we'd had more time to see the city. Even though they wouldn’t have been able to go into the casinos, they would’ve liked to see the unique architecture of the Strip resorts and shopping centers. 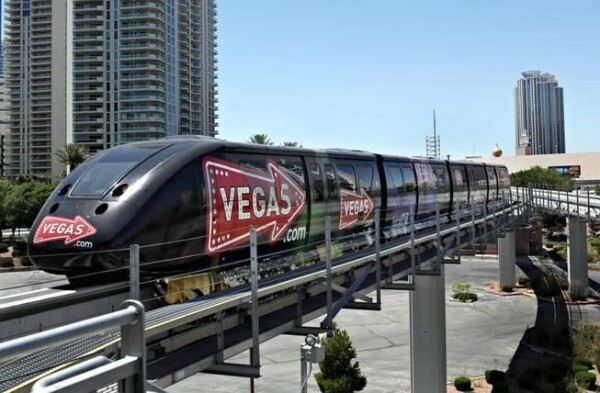 Because Vegas has a convenient light rail that takes travelers between the airport and the Strip, this would’ve been easy to do. If the airport you’re stuck in has a light rail or bus system to the main areas of town, and you have enough time, you might consider taking an impromptu tour to see the sights.